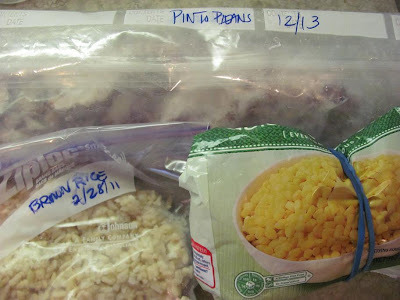 Heat rice and beans in the microwave until heated through, about 2 minutes (I cover with microwavable plastic wrap to trap in the moisture while heating up). Add corn and stir to combine. Plate the lettuce and top with the rice mixture. 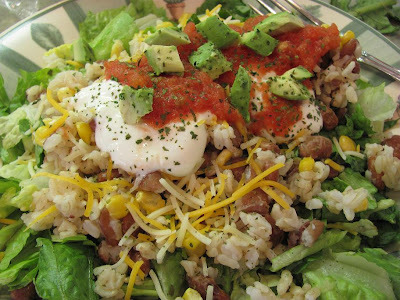 Top with cheese, sour cream and salsa (and optional avocado). This is a single serving and comes to 424 calories with the avocado. But you can easily calculate this based on the components. This is so good and filling! 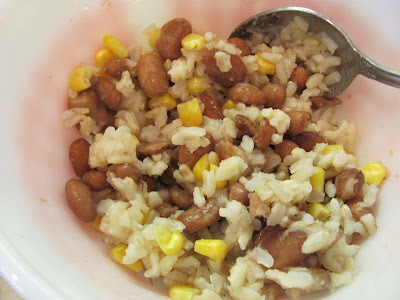 It reminds me of Stacy's Southwestern Chicken and Rice. We eat that a lot too. Will have to check out your recipes. Need cold lunches for long service days. I came across your blog from Good Cheap Eats, and had to try this salad :) I've been craving some summery, fresh flavors so we're having it tonight! I'm adding a little salsa chicken( for my husband who still requests meat for most meals) and some fresh cilantro! We've been looking for good meatless/lower meat meals, and with the beans & rice, I hardly had to use any chicken. Thanks for the great recipe! Can't wait to try this one. It looks amazing! Thanks for sharing!